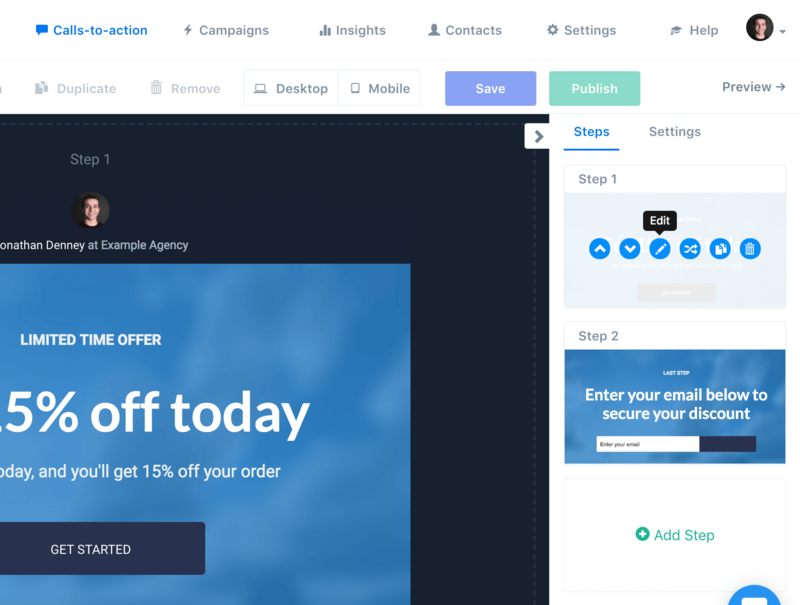 In this guide, you'll see the anatomy of the CTA builder and how it can help you craft beautiful on-brand CTAs for every marketing campaign. Once you're in the CTA builder, the first thing you may notice is the CTA steps on the right. Think of "steps" in the builder like slides in a presentation in your favorite presentation app, except it's interactive for visitors on your website. 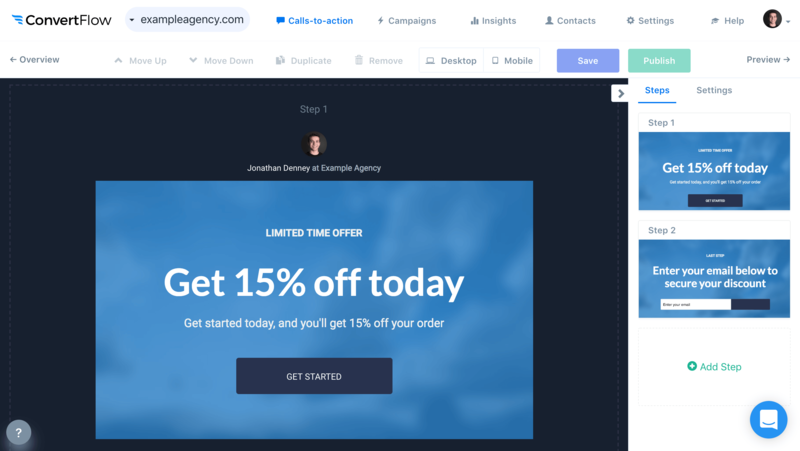 In ConvertFlow, lots of the CTAs you build may have multiple steps, to guide visitors down a conversational path and present the right message to visitors each step of the way. In the builder panel, under the "Steps" tab, you can manage the steps of your CTA. You can add, delete, arrange, edit and duplicate steps. When you click to edit a step, you'll be able to give it a name for referencing this step in the builder and in your CTA conversion reporting. Each step is made up "sections", which are content blocks that can have various column layouts. Once you click on the section's settings icon in the builder, the builder panel will then show section settings. In the section settings, you'll find multiple drop downs to toggle. You can toggle "Section Background" to adjust the background color, background image and/or background video of the section. Toggle "Column Layout" and you can split your section into 2, 3 or 4 columns with various column sizes. 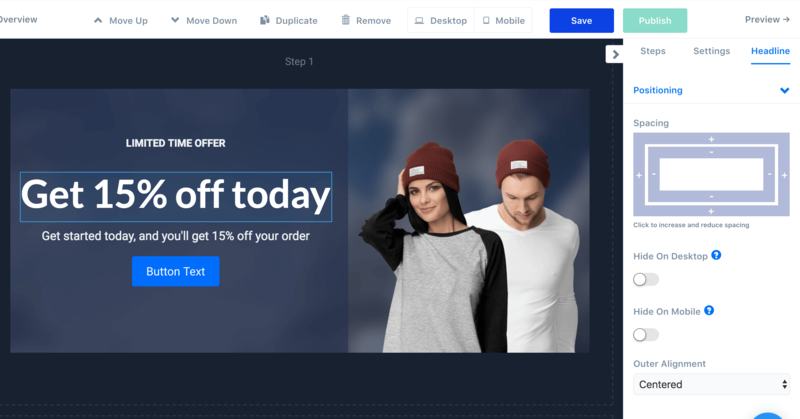 Below the "Column Layout" drop down, you'll find drop downs for each of the section's columns, where you'll be able to control that column's padding, background color, background image and more. You can also click directly on the column to automatically go to that column's settings in the section settings panel. 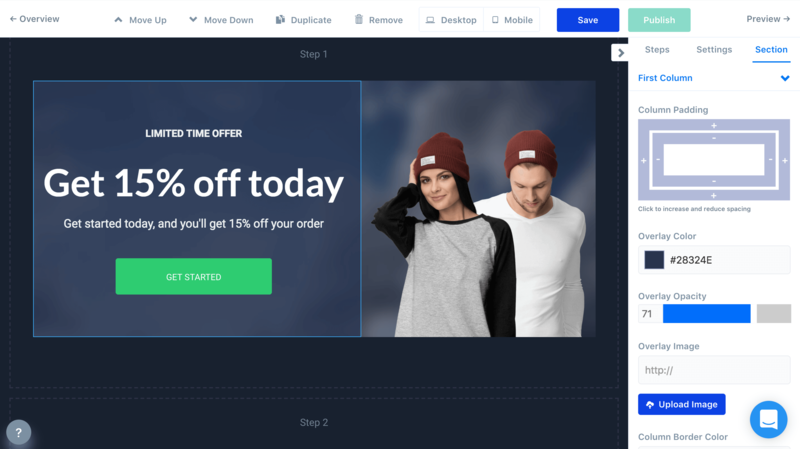 With each column having it's own background style options, each column can cover the section's background in it's own way, helping you design more visually engaging CTA sections. 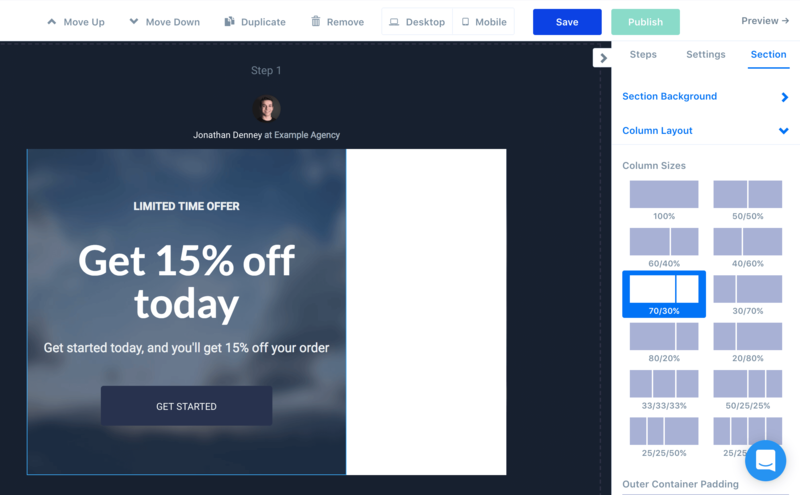 Each section column can have multiple "elements" that you can add, to display the CTA content you desire. Hover your mouse over any column and click the green plus + icon to add more elements to the column. 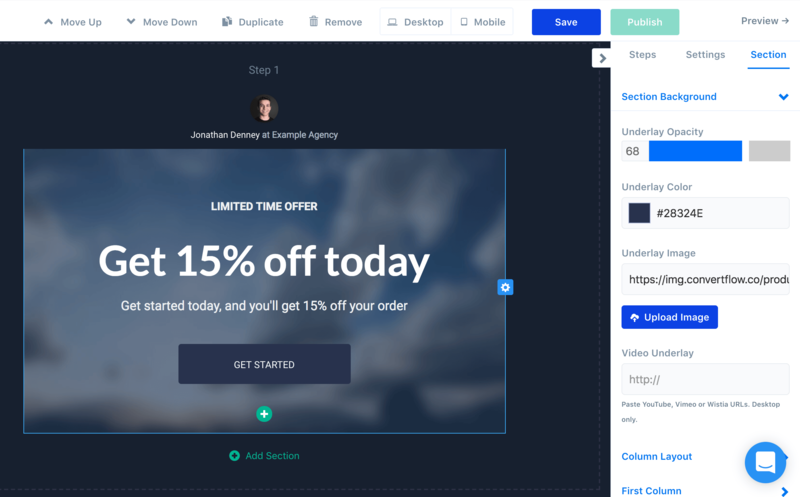 Row elements help you contain other elements inside boxes that can have their own styles and column layouts, helping you make complex content like pricing boxes, etc. Elements can be positioned by dragging them and dropping them inside columns. They can also be ordered by clicking the "Move Up/Down" buttons in the builder toolbar. Once you've selected an element, the top toolbar buttons will then apply to that element once it's selected, allowing you to use buttons to arrange them up/down, duplicate the element, or remove the element. 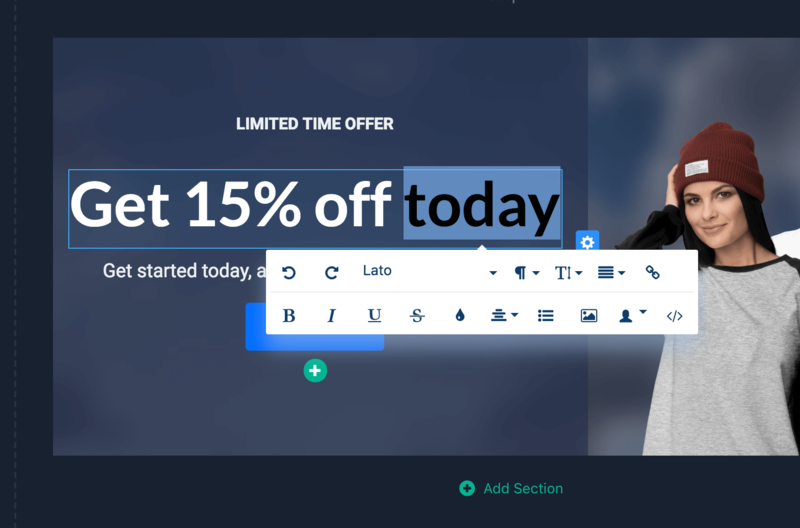 If you double click on text elements, such as headlines, paragraph content and button text, you use the text editor to customize the content and style words. Pro tip #1: Want more text style control? Click to the bottom right to switch to HTML mode and customize the styles to your liking. Pro tip #2: Using the "Personalize" text option, you can add merge tags to your text elements to display info on people you've already collected. You can also use URL parameter merge tags for dynamic text replacement. Once you've selected an element, the element's settings will be available in the builder panel. You can add spacing and control the outer alignment of the element. Forms, buttons and surveys have additional settings that can be adjusted. At any time while using the builder, you can switch between a desktop and mobile canvas, by clicking the device toggle in the toolbar. 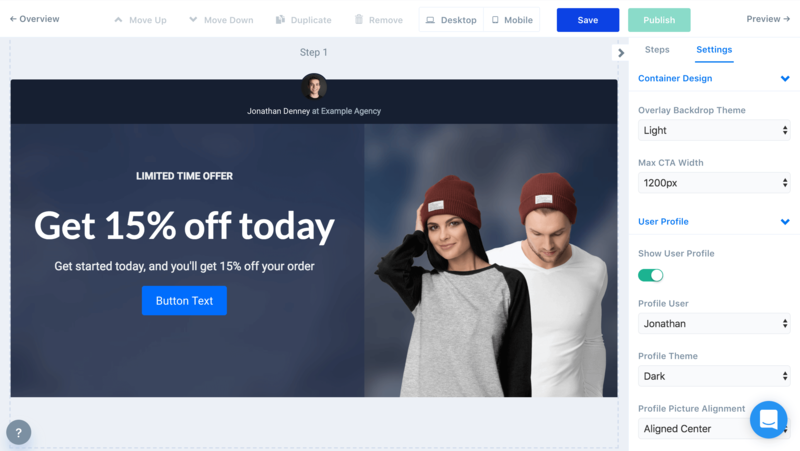 While ConvertFlow's CTA content is mobile responsive, meaning it should look fine by default, it helps to be able to control the positioning of these responsive elements for desktop and mobile separately. By switching to the mobile canvas, you can apply mobile specific padding and outer alignment settings to your elements. Also, for elements and sections, you have the option to disable or enable them entirely for desktop or mobile, allowing you to create separate content for visitors using different devices, as displayed in the screenshot above. In the builder panel, there's always an option to adjust the CTA's container settings. Just click "Settings" at the top right. Here you can adjust the style of the CTA container, such as the size of the CTA, and you can adjust the backdrop color for popups. Your CTAs can also display ConvertFlow's official user profile widget. Enable this by toggling the option, choose the user in your account that you want to display a profile for in the CTA and adjust it's style. Displaying one of your team member's user profiles can greatly help increase engagement from visitors, especially if they're following your personal brand. As you're making changes, make sure to hit the blue "Save" button to the top right to save your work. On Macs, you can click command+s to save your work. If you try to leave with unsaved changes, ConvertFlow will remind you. Lastly, once you've saved your changes, you'll be able to then "Publish" those changes live. Having the ability to publish changes only when you want allows you to stage new changes for live campaigns. Note: This doesn't control whether the CTA displays live on your website. That's controlled on the "Launch" page of your CTA.